On Sunday I taught primary. The lesson was on the Golden Rule and the lesson suggested making playdough for the children to make something that resembled a treasure that was special to them. So I got to work and made some playdough. but I thought I would share with you our little adventure. first I had to make the playdough. . .
and like magic the recipe will appear! combine all your ingredients together in a medium size sauce pan. Make sure your pan has a sturdy handle to hold on to, because this stuff gets sticky stiff, I mean we are making playdough, so imagine yourself trying to stir playdough on the stove. You need to have a firm handle to hold while you stir while it’s cooking. and finally, it looks like, well. . . playdough! next let it cool down a little . . .
dig the playdough out of the pan and knead it for a couple of minutes. I wanted several colors so I divided mine into six portions. If you only want one color you can save yourself a little mess and color the mixture BEFORE you begin cooking it. because I kneaded my colors in after the playdough was made, and didn’t want hands and fingers that looked like they came directly from a Dr. Seuss book I put on gloves that I could just throw away when I was finished. When I was finished coloring my playdough my hands would have looked like this! The lesson recommended that the children create something that looked like something that they owned that was like a special treasure, that they cared about a great deal. So we had fun in primary today, I hope they went away with what was supposed to be the object of the lesson. . . This past few weeks we have been in complete disorganization due to some unwelcome guests. The genius and myself have not had much motivation to put the kitchen back together because. . .. well the week after Thanksgiving. . . we get to empty it out again. So in contemplating what to write about this week I decided to talk about the daughters favorite cake. . . Oatmeal Spice Cake. This is the same cake we creatively rescued just a couple of months ago. . .I have gotten more than one request for this recipe. I have pictures ready, so it was an easy solution for today’s post. Anyway, cover these with boiling water and just let them rest on the counter somewhere. in the meantime combine the sugars and Crisco with an electric mixer. add the dry to the wet and with the paddle attachment or a large spoon mix until everything is well combined and moistened, be careful not to over-mix the batter, just mix until everything is mixed together. pour into cake pans. one recipe will make a 9X13 or if you want two 8" round cakes you will need to 1 1/2 times the recipe. I used springform pans, but you can easily use regular pans too, just remember if you want to dump them out to put on a platter, make sure to rub them with crisco and dust them with flour first. you know they are done when the cake just barely pulls away from the sides and if you insert a toothpick it won’t have any batter sticking to it. I usually run a knife or flat angled spatula around the edges just to make sure. most peeps won’t have this tool, but I am looking for a rich, decadent filled layer cake so I will torte mine to achieve that. I have four perfectly level layers to fill with topping and cream cheese icing. If you don’t have a cake slicer like this you can use dental floss and toothpicks to keep everything lined up. . .
first level the top of your cake. . . cut off the rounded top part from baking. . .
then mark both the top and bottom layers with a toothpick. Because it is impossible to cut perfectly even through a cake. . .
the toothpicks will by your guide and keep everything lined up as you reassemble the cake and it will be level when you are done. Then place your floss where you want to cut. Try to keep it as even as possible around the cake. Pull both ends of the floss together and it slices through your cake very nicely! similar to the same way as I cut cinnamon rolls it’s just that a cake is bigger and laying flat when you cut it rather than on it’s side. . .
oh, and it’s already cooked. Leave the toothpicks there until you are ready realign the top and bottom cakes together, after they are filled with yummy filling, The toothpicks will act as a guide when reassembling your cake. It is my recommendation that you use unflavored dental floss. Somehow mint mixed with spice just doesn’t work so swell. . . at least in my mind it doesn’t. So you don’t have to move your beautiful creation, or fuss with attempting to clean your serving platter, simply put 4 strips of foil around the bottom of your serving platter like this. One layer at a time put the filling of your choice in and stack them up until . . .
for this part it’s okay if you get crumbs in your icing. . .
crumby icing doesn’t matter until the next step. . .
ice the entire outside surface with cream cheese icing. . .
this is where you don't want crumbs in your icing. . .
next drizzle warmed, not hot, caramel sauce around the edges. Make sure you use a good, thick, high-quality caramel topping, and be careful not to get it too hot. For this cool drizzle effect. . .
squeeze, relax & drag, squeeze, relax & drag. . . .
repeating this around the entire cake. This will take a tad bit of practice but the effect is well worth the effort. If you don’t have a pastry bag, put the warmed caramel sauce in a baggie and cut a small hole in the corner to get your nice little drizzles. If it is too hot it will just run everywhere, so be careful not to get it too hot! your cake is finished. . .
simply, gently, pull the foil from under the cake one piece at a time. . .
now you know one of my little tricks. . .
perfecto- - - you have a perfectly clean surface to present to your guests. you certainly could add a border at this point if you choose to, but for today we decided not to do that part. The genius has helped me to create a “Button” so if you want the recipe you just click on it and it will magically open a printable copy of the recipe for you.
. . . Pretty cool I think! Pie Anyone? . . . It’s Thanksgiving! Thanksgiving is without question my favorite holiday of the year. But because of our war against the bugs we are still living out of boxes for the most part and decided to simplify dinner. We went out for Thanksgiving dinner. However we still made pie! It all began innocently enough. . . The daughter and her hubby, the businessman were going to contribute by making pie to bring. The daughter wanted to make an apple pie and a pecan pie. Perfect, those are great choices. The daughters first Apple Pie without one-on-one tutoring. . . very impressive for a first time pie creation! She was a little distressed about it but we made her bring it anyway. . . it looks okay, but the flavor was good. . . . and let’s be honest that’s the most important part! Then I received a call from the musician even though we were eating out, he still wanted to make HIS pie. . .
okay, we can do that. He also wanted apple. Apple pie is good we’ll just have two of them. Then the genius wanted to make a pie. . . .
my favorite pie is cherry. . .
the businessman announced he didn’t want to make pie . . .
. . . He wanted to BUY his pie! . . . . WHAT you ask. . . he DOESN’T want to make pie????? it hurts to even type that sentence, I can’t imagine what you are feeling while reading it! okay, this year we’ll be nice. . .
. . . come to find out. . . the businessman doesn’t care much for pie! This keeps getting worse. . . I don’t know if I can handle this or not. . . This should be a deal breaker. . .
or. . . the first two weeks of September. . . AND likes pie kind of girl. 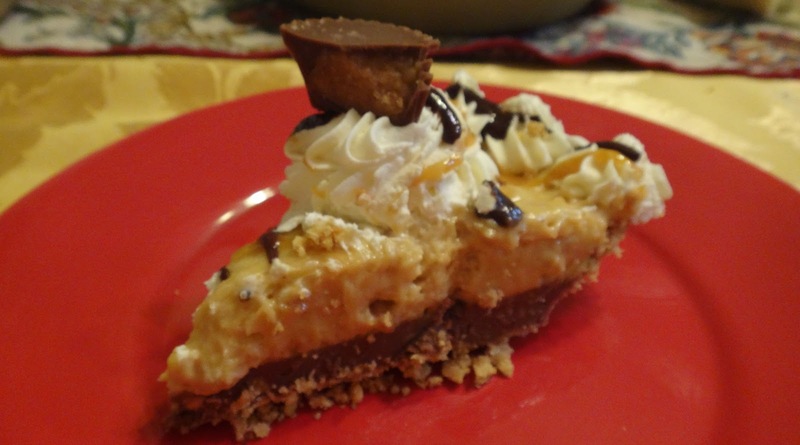 . .
make sure to take notes on these VERY Important instructions. . . .
Peanut Butter Cup Pie from Village Inn. . . for the rest of you, we were nice to the businessman, and by the weekend’s end, he admitted that Cherry Pie was pretty good too. . .
ooohhhh. . . . What about our famous Pumpkin Cream Pie? I can honestly say. . . I believe we have arrived! well, let’s just call it. . . .
cooked too long. . .
the list of reasons for failure seemed to endlessly evolve around these same points each Thanksgiving for as long as I can remember. . . as a child. . .
a couple of years ago I set out to figure out what was wrong and fix it. and tried various methods and have finally come to the final product. . . Perfect Pumpkin Cream Pie. . . Consistently! seven pies for Thanksgiving. . .
Don’t ask me how we plan to eat all of these pies. . . I haven’t figured that part out yet. we are going to be eating pie for a while. Just for the record the pecan was the first to go, then the Peanut Butter Cup followed by the Cherry. We are still working on the rest after sending pie home with anyone who would take pie. I think I will give pie away. . .
take it to work. . .
give it to the neighbors. . .
No pie for Oscar Dog. . . I don't like cleaning up after sick dogs! It’s all good pie, but a person can only eat so much pie. The best news is that in addition to perfecting our pumpkin cream pie. . . I have also created a pretty great crust for our other pies too! To me that’s success and I’m a happy camper today! For us here at our house Thanksgiving wouldn’t be Thanksgiving without pie! But Let’s get back to dinner for just a minute. . .
My great regret of the day is that I forgot to take my camera to dinner. the restaurant of choice was The Elements. As they escorted us to our table I was thinking you are kidding me. . .
they took us to this wonderful round table decked out in linens and crystal. . . right in front of the fireplace! Which was in front of a large picture window looking out over the patio which was graced by a River. While it’s a tad bit chilly for an outdoor meal, it was beautiful nonetheless, and let’s be honest, I was in heaven in front of that fireplace. . . . I couldn’t have asked for any better. Initially I was concerned that there wouldn’t be enough food, but couldn’t have been more wrong in my musings. Turkey, the most incredible moist turkey breast I have ever had the pleasure of eating. . . stuffing. . . sweet potatoes. . . mashed potatoes, salad. . . fresh, perfectly cooked, green beans. . . amazing gravy. . . then. . . .
. . . . Deseret! or this apple galette with the most amazing ice-cream in the center. . .
. . . oops, I already ate that part. . .
there’s ALWAYS room for ice-cream! We were all sooooo full from dinner that we ended up taking our desert home with us to eat later, the plate presentation was delicious, but trust me we didn’t have any problem eating until we couldn't eat anymore! While the food looked beautiful, it tasted as amazing as it looked. However, I'm still feeling a little nostalgic for leftovers of turkey and stuffing, and. . . . well everything that goes with Thanksgiving leftovers. . . we'll try for new years.
. . . would you care for some pie? Or, I guess we could label it venting. . . Remember when we were so excited for the missionary (now the musician) to come home, well perhaps we should have held off a little on the excitement. . . .
see, as a result of him coming home he brought some VERY unwelcome house guests! The tragic part of this is that he isn’t even here to be part of the fun they have caused. just in case you’re a teeny-tiny bit curious as to who these house guests are. . .
Jut to clear up any confusion. . . I have done nothing but be disgusted by them. I know for a fact that they are living inside the door of the dishwasher, (where the arrow is pointing), because I have personally watched them take refuge there, as well as behind the stove. At first I thought they were just a funny little bug migrating in from outside looking for refuge from the oncoming winter and was just disposing of them accordingly. When the musician was home for the b-day celebrations I heard this wee little conversation coming from the kitchen. . .
DON’T TELL MOM. . . . WHAT??? except is was more in the form of a demand, than a question ~ ~ ~ those obnoxious little bugs were identified. . . cockroaches! The genius served his mission in Florida and also had plenty of experience with these little critters, why he didn’t identify them sooner is still a mystery to me, but in the end the decision was made. . .
I’ve never had to call an exterminator before. . . this is a new experience! in short. . . get stuff off the floor, away from the walls and clean out the kitchen! I seriously need to consider getting a bigger house and garage or to simply get rid of some of my long held treasures. . .
. . . but that is a debate for another day. Today. . . I just need to get the house emptied out by 11:00 am Wednesday. I think I may liquidate some stuff with this process. . .
see, I think I have waaaayyyy tooooooo much hanging around! the genius did a great job of taping all the boxes. . .
and we easily justified the purchase of boxes today. I didn’t have to work on Tuesday and so ALL DAY LONG we boxed up the kitchen. the genius summed it up like this. . .
so onward we forged. . .
but we found some interesting treasures in the process. . .
I’m glad we found this guy hiding back in the corner! not much longer and we would have been cleaning this cupboard out anyway. how many of the same item does a kitchen need? Some of these haven’t even been opened. . . Note to self ~ ~ ~ do inventory before going shopping!
. . . All day Tuesday, until 1:00 AM. . . up at 4:30 am. . .
all that work. . . and he was done with his part in about 35 minutes! ugh. . . I couldn’t get sleep after work until. . . I cleaned off my bed! lots of stuff. . . I think I just need more space ~ ~ ~ ! yup, exactly 28 days from now we get to do this again. . .
and another 10 minutes to locate the pan to cook it in! We have found a small handful of dead bugs. . . I think we call that success! we are hopeful. . .
the kitchen and the pantry are different . . .
they will need to be done regardless of what we don’t see. . .
no more bugs. . . The daughter hates bugs! I have been able to get rid of some stuff. . .
but most of it. . .
will find a spot in the cupboard or closet that it came from. Thank you for being willing to listen to my whiningventing! But honestly, this project just about put me over the edge. As for right now, I think I will just go and empty another box.
. . . and the process continues. . . are you bored? Visitors are always welcome! Well, that is. . . unless you are a bug. . .